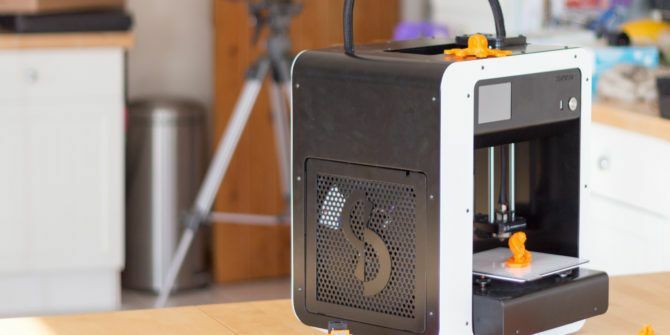 After a successful Kickstarter campaign, Skriware have brought a new 3D printer to market, which aims to be as consumer friendly as possible. It’s short on hardware innovations, but offers a satisfying if somewhat limited experience for beginners in a well designed package. It costs $1299 for the model as reviewed here. Skriware have opted for a tough, industrial design, with a powder-coated steel case and no obvious access to the internal mechanisms (though the panels can be removed with the right tool, which I eventually had to do a few times to extricate clogged filament). Although harder to fix mechanical issues, this certainly has the effect of being more beginner friendly. The standard chassis color is white and black, but other colors are available for $99 extra. This thing is not at all lightweight – far from it, at just under 20kg with a full roll of filament inserted. The metal design isn’t just for durability and looks – it can also help with print quality by reducing vibrations, which can introduce small errors into your print. Be sure to put it on a sturdy table though. The print area is fine for home use, but with the caveat that without a heated print bed you’re unlikely to get a successful print of the full size anyway. The all-metal enclosure does limit your future options, however. Many 3D printing enthusiasts who have purchased or built their printers from an open-source design invariably end up upgrading their device: a better extruder, a larger frame, a heated bed, a self-levelling sensor, or perhaps a multi-extruder. You won’t be able to do any of that with the Skriware, so what you see is what you get. The main hardware innovation that Skriware brings to the table is the flexible, magnetic print bed. It’s never been easier to unsnap the bed, flex a little to pull the print off, then clean and place it back again. Anyone who’s had to play with a knife to try and prise their print away will appreciate this – it’s a no-fuss approach that 3D printing beginners are going to be spoilt by. Before printing, you’re required to do a quick calibration by adjusting the 3 manual levelling dials and a piece of paper. It’s a simple process, though somewhat fiddly if you have fat fingers, that you’ll need to repeat once every few weeks or when you move the printer (or when you notice the first layer just isn’t sticking right). However, the choice of making it a magnetic bed did unfortunately exclude the option of a heated print bed. This has two consequences. Firstly, larger PLA prints can be prone to warping at the edges. I was unable to take full advantage of the full print bed area because of this – a number of larger items I tried to print simply failed. The largest I could manage was about 8cm at the longest point. Second, the machine can’t print in ABS. This isn’t a big loss for home users, since ABS can release toxic fumes, though this obviously limits pro users. PLA plastic is actually biodegradable and made from renewable resources, which somewhat appeases my inner environmentalist when I think about all the random plastic stuff I’m creating. There’s no DRM-restrictions on filament – it should work with any kind of 1.75mm diameter PLA. For the best chance of success, Skriware also advise that you clean the print surface with rubbing alcohol between prints – this removes any grease or oily residue that can prevent the print from adhering to the surface. Once your Skriware printer is sitting on the network and linked to your online account, you can browse through the Skrimarket and select a model for printing. Just click “Print”, and it’ll be uploaded directly to your printer, then begin printing as soon as the print-head has heated up. There is no further interaction needed on your part – just make sure the bed has been cleaned and placed on the plate. This is certainly the most innovative method of printing I’ve seen yet, and you really couldn’t ask for anything more beginner-friendly. The Skrimarket lacks some fundamental features however, which I hope the Skriware team will consider adding. Specifically, things like the amount of filament needed to print the model, or some dimensions of the print (the models are already sliced and ready to print, so they have a set size and can’t be scaled up or down without the original model). It’s still very early days for the Skrimarket, and at the time of writing there’s less than 400 models available. This is obviously rather limiting, and you’ll soon find yourself reaching for other models available on the internet. If you want to print anything not on the Skrimarket, you have two options. The first is Skriware’s new online easy slicer. Like the Skrimarket, it’s a very simple affair – just drag and drop a model, resize, and reorient. There’s no additional options, and it’ll automatically add supports and a raft (a thick layer of plastic under the model which helps it to stick to the bed) whether you want them or not. In short, it should work fine for simple models. Your other option is to slice it yourself using a third party tool such as Slicr or Cura. You’ll need to contact support for the exact settings to use for the printer, because the profile isn’t available to download on the site nor is it listed in the help files. From there, you’re pretty much on your own, though their support was incredibly helpful. There are more user-friendly options for slicing software, which can directly print over the network or over USB to some prints: Microsoft 3D Builder supports a number of printers, but the Skriware isn’t one of them. Simplify3D ($150) also supports a huge range of printers, but not the Skriware. You can still use the software, but you’ll need to export the GCODE first, then load it into the Skrimarket to cloud print, or put it on a USB drive. However, it’s possible Skriware could add the ability to network print at a later date. As a relative beginner to 3D printing, I found myself wishing there was some middle ground. The tools that Skirware offer felt too simple, while the number of options in Cura was just bewildering. Assuming your print bed is level (I found this was the reason for most failed prints), the quality you can get out of the machine can be incredible – the best I’ve seen so far – especially considering the simple “plug in and print” ease of use of the device. When printing from the market, you don’t have any control over quality, so the models you see below should print in the exact same way for you – the only variable will be the type of PLA filament you use, and that shouldn’t make a huge difference. When printing your own models, the quality will vary significantly according to the exact settings you’ve sliced with. Slower prints are better, as are smaller layer heights, but there’s hundreds of factors that can affect quality, and it’s something you’ll need to learn. However, that’s not to say things won’t go wrong. It’s a fact of owning a 3D printer that nozzles will get clogged, filament will get stuck in the feed, and it will need some kind of maintenance. The support team was very helpful in these instances, but my point is that just because a printer costs $1300 doesn’t mean it needs zero maintenance. Should You Buy the Skriware Printer? The Skriware printed is marketed specifically as an easy to use device for beginners, so we’ll focus our judgement on that. The concept of the one-click Skrimarket is to act as an on-boarding for those with zero experience. Where other printers tell you to design anything you want, then print it, you can often stumbling at the first building block. Cubify Cubify Cube 3D Printer Review and Giveaway Cubify Cube 3D Printer Review and Giveaway Most affordable 3D printers are sold as self-assembly kits, but the Cubify Cube promises to be plug-and-plug with minimal fuss. Does it live up to that promise? Read More offered simple model generation apps as their on-boarding process: tweak a few settings to create your own customized jewellery or Christmas decorations. Skriware offers you an Amazon-esque one-click printing of anything on their market, yet still allows the freedom to print other models with simple cloud slicing system. After a few months of using the Skriware, I’m convinced a 3D printer is something I’d like our family to have. In that respect, the concept of the one-click print Skrimarket as an on-boarding process obviously works. But there’s a couple of factors that would hold me back from purchasing the Skriware for myself. First is the size limitation. As I mentioned, despite having a reasonably sized print bed, I was unable to make full use of it without the edges warping, which a heated bed would probably have fixed. Then there’s the lack of community. One of the great things about owning a common 3D printer is that there’s so many others out there who can help you with issues, suggest upgrades or how to improve a particular print. But I’ve yet to find a single Skriware owner, and that’s ultimately down to … the price. $1300 is an awful lot of money for a beginner who’s looking to get started in a hobby. At that price point, I feel Skriware have limited themselves to schools and larger institutions. Skriware isn’t the only printer that set its sights on the beginner market. But the truth is that no 3D printer available at the moment is perfect for beginners, or frustration free, and I’d be lying if I said you’ll never have issues with the Skriware either; and I’ve yet to see a printer marketed at beginners that prints large models in any satisfactory manner, so the Skriware isn’t inferior on that front. However, it’s also tough to recommend the Skriware device to pro users, given the lack of advanced features – such as a dual-extruder, larger build areas, or a heated print bed. The Skriware is a great printer, but I don’t feel that it’s pushed the technological side of things on from where we were a few years ago. It certainly looks like just another household appliance that would happily sit alongside my laser printer, but I’m not sure that’s something I’m willing to pay such a premium for. Explore more about: 3D Printing, MakeUseOf Giveaway. Skriware 3D printer can be boost to aerospace industry to print complex component . I would appreciate more feedback . It is remarkable innovation . The "Follow MUO on LinkedIn" button for an entry is not working on any of the giveaways. I do follow MUO on LinkedIn, but have been unable to claim that entry for the last 3 or 4 giveaways I have entered. Wish to be lucky one this time. Fingers crossed tightly. WOW, this looks amazing ! My husband has been trying for almost a year now to build a 3D printer ... he's been making progress, but there's still more to go. Would love to win this for him, I think it would be his dream come true :) Good luck to everybody who entered ! Wow that's amazing. Wish to get it in my hand. 3D printers are a ton of fun, I recommend trying them out if you ever get the chance. There is a library in our town called DoSpace that has a few 3D printers, you design something on tinkercad.com and bring them the file on a flash drive and they'll print it for you- all you pay for is cost of supply, which was around $10 when I printed a Raspberry Pi case. I would love to have this 3d printer to print out 3d models that me and my friends have been making for the last two years. There is nothing like this anywhere near where I live! I could use this for my classroom! Would love to win it so I could teach 3D printing technology to my students.